May 4, 2013 - At about 4 PM on February 4 2012, a Robinson R44 helicopter, registered VH‑COK, lifted off from Jaspers Brush Aerodrome, New South Wales for aerial photography of the launching of a deep sea submarine in nearby Jervis Bay. 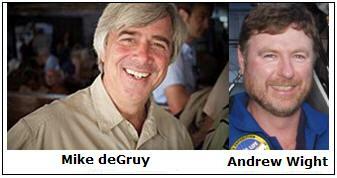 On board the helicopter was the pilot and Australian filmmaker, Andrew Wight, 52 and American filmmaker and camera operator, Mike deGruy, 60. Soon after lifting off the pilot’s door opened and the pilot reached out to close the door. Simultaneously the helicopter abruptly pitched nose-up then steeply nose-down, rolling to the right before the right landing gear skid and main rotor blades struck the ground. 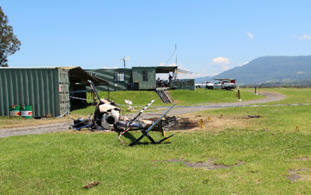 A fuel-fed fire started in the vicinity of the fuel tanks and lower mast area prior to the helicopter coming to a stop. Both occupants were fatally injured and the helicopter was destroyed. The Australian Transport Safety Bureau (ATSB) found that the pilot’s door was not properly latched prior to lift off and opened during the turn to depart. In attempting to shut the door the pilot probably let go of the cyclic control from the normal (right) control hand, allowing for an unintended, abrupt nose-up pitch and the helicopter tail hitting the ground. 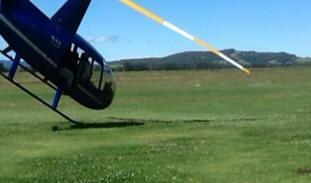 The helicopter nosed over and impacted the ground. A fire began when one of the fuel tanks was breached. The ATSB identified that the fatal injuries were due to the post-impact fire, as was the case in a number of other R44 accidents. A number of these R44s, including VH‑COK, had not and were not yet required to have been modified in accordance with a manufacturer service bulletin that specified replacement of aluminum fuel tanks with more impact resistant bladder type fuel tanks. The installation of these tanks decreased the risk of a post accident fire. At the time of the accident, these tanks were required to be fitted by 31 December 2014. In response to this and a number of other fatal accidents in other R44 helicopters, the Civil Aviation Safety Authority (CASA) and the ATSB have separately highlighted the benefits of the upgraded bladder-type fuel tank and related modifications to operational and maintenance personnel. In addition, the helicopter manufacturer has progressively reduced the compliance time on service bulletin SB-78 in respect of the installation of the bladder type fuel tanks to April 30, 2013. A second bulletin aimed at removing a possible impact related ignition source was also issued and the manufacturer is issuing advisory information emphasizing the importance of maintaining control of the helicopter during an unexpected event. This accident highlights the importance of ensuring all doors are secured prior to takeoff. That said, the opening of a door in flight will not normally affect the operation of an R44, but the instinctive reaction to immediately deal with such an event can be quite strong. Pilots need to be aware that this reaction may be hard to overcome and in the event of an unexpected situation occurring such as the opening of the door, it is vital that pilots should continue to ‘fly the aircraft’. This includes choosing to land to close the door if necessary. The fitment of bladder-type fuel tanks to R44 helicopters is a worthwhile safety enhancement that could save lives and advice from CASA is that their installation in accordance with the manufacturer’s service bulletin by April 30, 2013 is mandatory. Andrew Wight (14 November 1959 – 4 February 2012) was an Australian screenwriter and producer best known for his 2011 film Sanctum. He produced over 45 films including television documentaries, live television specials and 3D IMAX films. His credits include Ghosts of the Abyss, Aliens of the Deep and Expedition: Bismarck. Andrew Wight has been honored with the Australian Geographic Society Spirit of Adventure Awards in 1989. Mike deGruy (December 29, 1951 – February 4, 2012) was an American documentary filmmaker specializing in underwater cinematography. His credits include Life in the Freezer, Trials of Life, The Blue Planet and Pacific Abyss. He was also known for his storytelling, most notably, a passionate TED talk about his love of the ocean on the Mission Blue Voyage. His company, Film Crew Inc., specialized in underwater cinematography, filming for BBC, PBS, National Geographic, and The Discovery Channel. His notable accomplishments include diving beneath thermal vents in both the Atlantic Ocean and Pacific Ocean. He was a member of many deep sea expeditions and was a part of the team that first filmed the vampire squid and the nautilus.